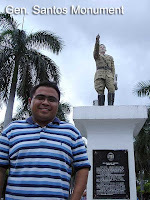 The next day, we drove to Glan, one of the southernmost municipalities of the island of Mindanao (Jose Abad Santos, Davao del Sur seems to edge it out by a few meters). In the town proper, we checked out the old houses which are mentioned in the DOT website. They have intricate wood designs but sadly, most if not all, have been neglected. 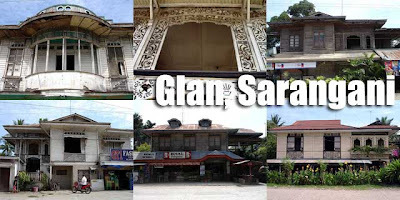 The local government should do something about it since old houses in Mindanao are quite rare nowadays. 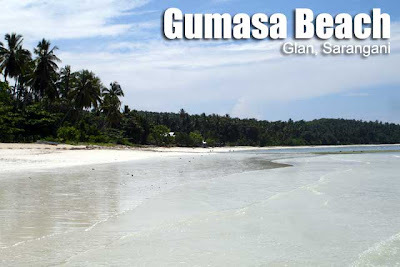 We then proceeded to Barangay Gumasa further down south to check the powder-white sand beach. Yes, you read it right, powder-white sand. It could be the next Boracay if the local government plays its cards right. After a few hours of swimming, we drove back to Gen San to catch our flight back to Manila. 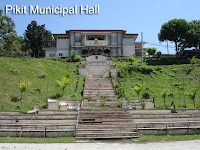 But we passed by the provincial capitol in Alabel first to meet some officials. 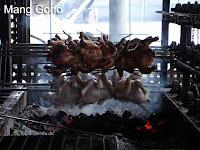 Back in Gen San, we had lunch at Nadie's Chicken Restaurant. Then after fixing our check-in luggage which was all fruits, we went to the airport. I had 26 kilos of fruits with me. Even if I paid for excess baggage, it still came out way cheaper! I got lansones and suha at PHP25 a kilo and mangosteen at PHP30 a kilo. Kalsangi is such a great place. 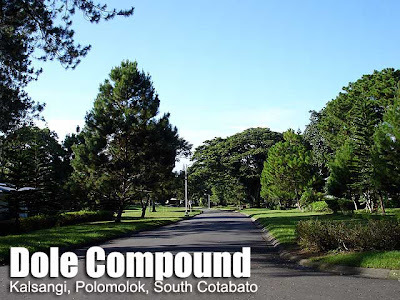 The exclusive residential and golf club complex for Dole managers reminds me so much of the US, maybe because of its lay-out and architecture, open lawns, trees and cool climate. The whole place sits at the foot of majestic Mt. Matutum. It was good the sun was out early in the morning so we checked out Mt. Matutum while the sky was still clear. We went around the Dole Plantation too. Notice the Norfolk pines? They used to be Christmas tree supply for Dole's expat managers. But since most of the resident managers and supervisors are now locals, the trees are no longer cut down every Christmas and have grown tall. After going to church, we visited the Trappistine Monastery (the sister monastery of the one in Guimaras) to buy some chocolate rhum balls and cookies, as well as Gibby's farm, also in Kalsangi. Then is was lunch at the Dole's Club Kalsangi. It's very difficult to get inside since you need to know someone connected to Dole to gain access. I had a double burger, fries and salad. After lunch, we brought Ryan to the airport then proceeded to Sarangani Highlands, a garden restaurant in Gen San with a great view of Sarangani Bay, for some drinks. The view and breeze was great! 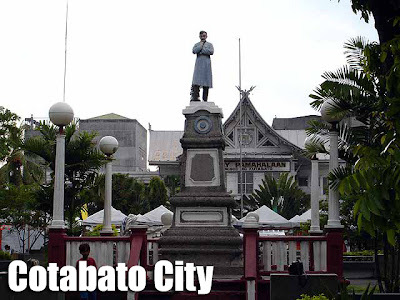 We then visited the statue and burial place of Gen. Paulino Santos in front of city hall. What a disappointment. 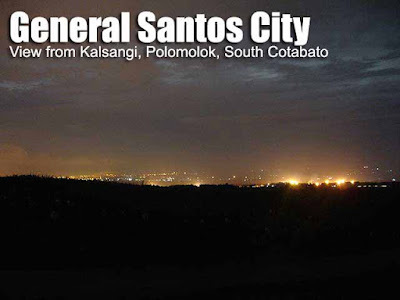 I was expecting more from a major city like Gen San. The city hall was an ugly nondescript building. 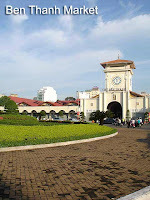 The park in front of it, as well as the monument of Gen. Santos was obviously neglected. If they fix it, it could be a really great attraction. I was told that after all the years under the Acharons and Antoninos, Gen San is still not improving as fast as it should be. SM has had several ground-breaking ceremonies in the city but they always pull-out for some reason. Anyway, we checked out the P30M house of Manny Pacquiao too before proceeding to Alabel, Sarangani for dinner. 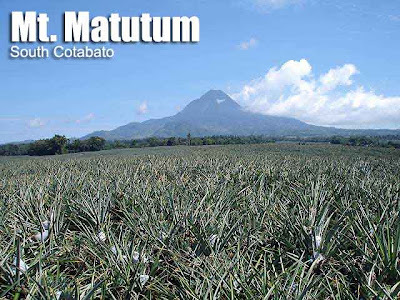 From Sultan Kudarat, we entered South Cotabato. 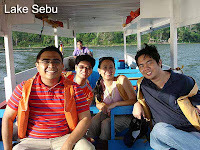 Our main stop for the day was Lake Sebu. 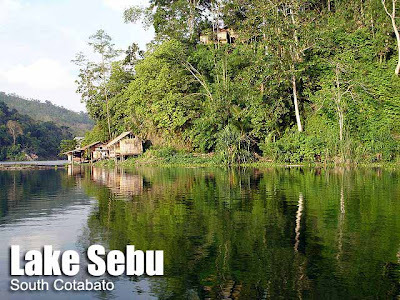 The municipality has three lakes including the main Lake Sebu. On the way, we got to see Lake Lahit. 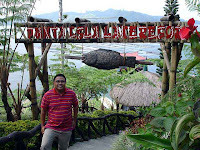 Before proceeding to the restaurant, we checked out the viewpoint of Lake Sebu beside the municipal hall. It was a disappointment since the view was not spectacular since it was blocked by trees. What a waste of PTA money! Guess whose name is painted on the structure? This shameless self-promotion in government is really sick. And next time they select and construct a viewpoint, they should make sure there is a view. Anyway, I didn't let that ruin my afternoon in such a great place. 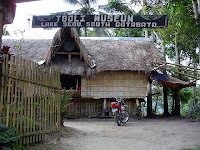 We passed by a small house converted into a T'boli Museum. Not so many items inside but we got some souvenirs there. 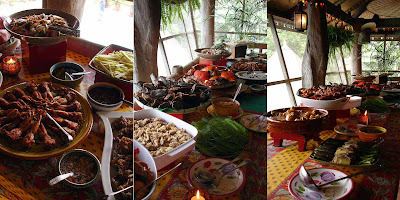 We then had a really late lunch in a floating restaurant of the Punta Isla Lake Resort where tilapia was the main course on the menu. There were over a dozen tilapia dishes in fact. The view was serene. Nothing beats eating amidst nature at its finest. After lunch, we took a pump boat around the lake. 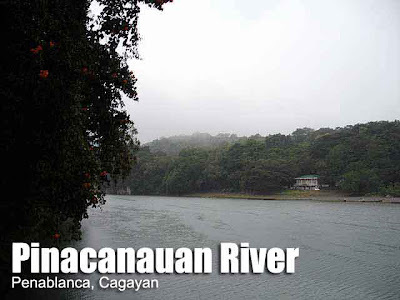 We spent PHP350 for the 45-minute boat ride. The area is the ancestral domain of the T'boli minority and we got to see their dwellings and way of life from the boat. 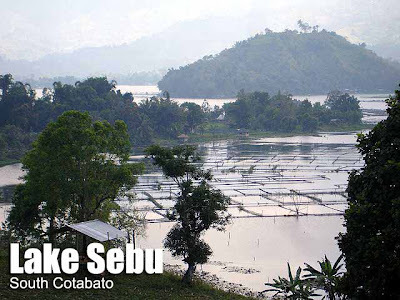 There are also several islands in the lake where the T'boli have built their homes. Sadly, more modern structures are crowding the banks of the lake. It uncontrolled, the lake may lose its charm. In fact, there was a gargantuan church built on top of a hill. I feel that it should at least been blended with its surroundings since it sticks out like a sore thumb. 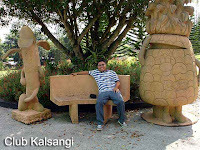 From Lake Sebu, we went to Koronadal to meet up with our brod Gibby and his wife Shay who live in the the Dole Plantation in Kalsangi, Polomolok where we were going to stay for the next two nights. On the way, we bought more fruits in Tupi. I took some night shots of Gen San from what they call the highest point in Kalsangi. I had been looking forward to this weekend for months. 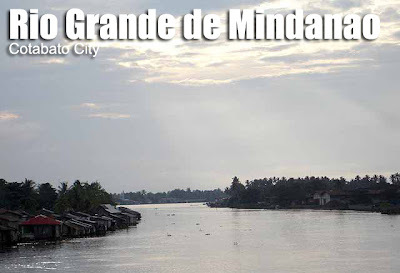 I went to Mindanao with brods Ryan and Allen, and our friend Ching. The tickets were booked way back April (yes, it's the P1 fare promo). We took a flight to Cotabato City (the airport is in Datu Odin Sinsuat, Shariff Kabunsuan) where the van of Ching's cousin picked us up. We visited Small World in the same town. Aside from the zoo, everything else was closed since the park is fully-open only on Sundays. 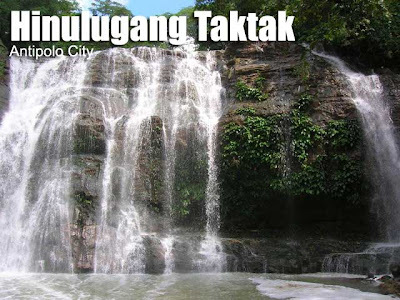 The Lourdes Grotto is also there but since the priests who own the place make it such a hassle to visit (you have to get a permit and leave your driver's license and all), we decided to move to our next stop, the Tamontaka Church, a national historical landmark. I had expected to see an old church. But it was totally new. 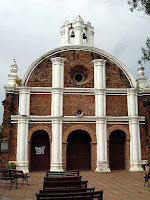 The older church was destroyed by a fire several years back. It was declared a national historical landmark just in 2004, long after the new and current church was built which thus came as a surprise to me since I know that the NHI requires a certain percentage of authenticity before declaring structures. 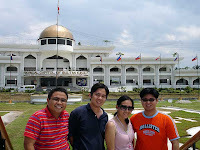 Anyway, we passed by the new Cotabato City Hall before proceeding to Mang Gorio for a late lunch. We ordered barbeque chicken and buko halo-halo. 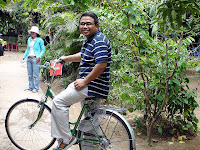 We also dropped by the Kuta Wato Caves but that was a big disappointment. It was so dirty, and you had informal settlers residing above the caves. I could just imagine where all their human waste goes. The city government should take out that tourism sign outside because it is no longer an attraction. It's such a pity since the natural pool inside the cave would have made it such an enchanting place. From there, we proceeded to the old city hall and town plaza. Our plan was to drop by the tourism office but it turns out, government offices close early on Fridays in this part of the country. Friday, is a day of prayer for Muslims and I was told it had been practice here that after services, employees don't go back to the office anymore. Oh well! The local government should encourage the rehabilitation of the early post-war commercial buildings in the town proper. These structures give the city a lot of character. 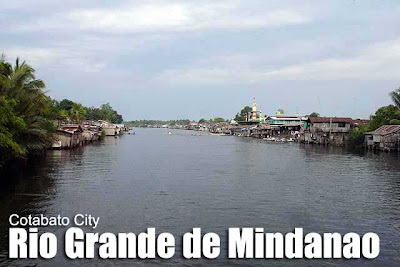 We also took pictures by the Rio Grande de Mindanao and its tributaries before driving to Midsayap, (North) Cotabato where we stayed for the night. I can't remember how long the drive was because I dozed off at times. 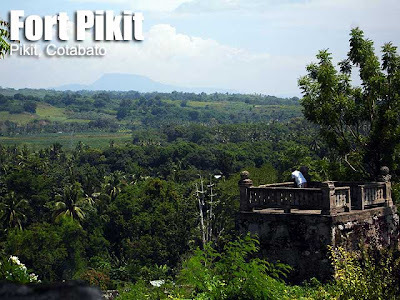 The view of the Mindanao countryside was a refreshing sight. Anyway, More photos in Multiply. 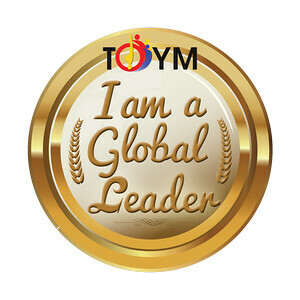 I'm in Tuguegarao City to speak at the 2nd Regional Youth Leadership Congress in St. Paul University. I took an Air Philippines flight which was two hours delayed! 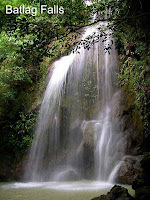 When I got here, we rushed to the Callao Caves to watch the bats fly out but since it was raining, they didn't. Maybe next time. The congress was today. I slept early last night and also slept the entire morning since I wasn't feeling well. 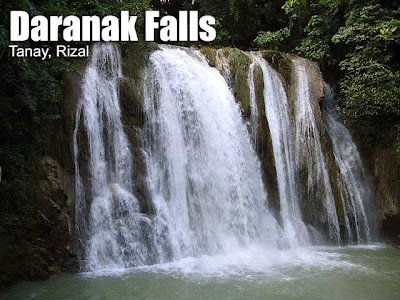 For the sights in Cagayan, just check out my older Cagayan entries. 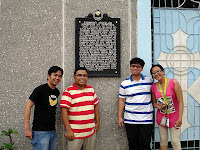 For this trip, I just visited the Ermita of San Jacinto which is in front of the campus. Now I'm just waiting for my bus ride back to Manila. 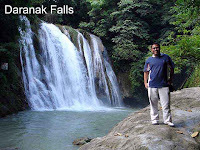 I could have opted for a plane but there is no flight which would allow me to make it to my flight to Cotabato tomorrow. 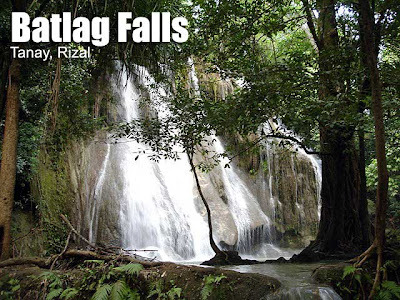 This Tuguegarao to Cotabato journey would be my personal record for the farthest distance traveled in the Philippines in a 24-hour period. 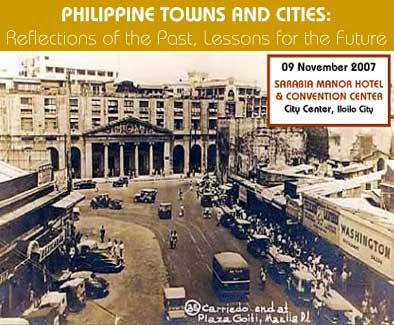 Join us at "Philippine Towns and Cities: Reflections of the Past, Lessons for the Future" on November 9, 2007 at the Sarabia Manor Hotel and Convention Center, 101 General Luna Street, Iloilo City. 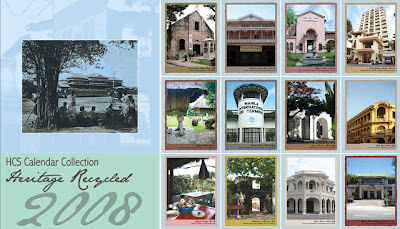 For more information, contact Ms. Dorie Soriano (HCS): 521-2239, 522-2497, info@heritage.org.ph; or Ms. Len Diño (UPF): 895-1812, 896-1902, 890-2480, annalynn.upf@gmail.com. My SSEAYP batch (Me, Dep, Nona and Pam) brought Noby, our Japanese batchmate, to Tagaytay today, part 2 of his birthday celebration. 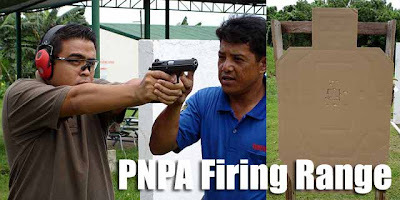 On the way, we passed by Dep's alma mater, the Philippine National Police Academy where we did some rounds at the firing range. It was my first time to shoot and thanks to beginner's luck, I did not miss my targets. Thanks for that Dep! On the way to Tagaytay, we debated as to where we were going to have lunch. And the salad buffs won so it was Sonia's Garden. It was my first time to have lunch there would you believe. And it was a good decision since I really like the ambiance of the place, eating in a garden atmosphere. Their business model was great since it was a set menu at PHP610 (tax inclusive), a sit down buffet of bread and spreads, salad greens, fruits, pasta, dalandan juice and dessert. As soon as you sat down, the waiters immediately brought in the bread and salad so there was no waiting time. If you wanted more, you simply asked the waiters to brings in more. It was a really healthy treat and very much worth the visit! Pia followed us there. And after we were done eating (we were all so full), we drove back to Manila. We had wanted to go around the garden outside but it was raining. We got some buko (coconut) and other fruit tarts from Amira's which is a small shop along the National Highway; and some burgers at Mushroomburger before proceeding back to Manila. I was asleep the whole time, tired from so many days of traveling. Anyway, more great photos in Multiply. I trooped to Pampanga today to attend a party hosted by Larry Cruz (he's the man behind Cafe Adriatico, Cafe Havana, Bollywood and Abe Restaurant among others) in Abe's Farm, an emerging resort at the foothills of Mount Arayat. 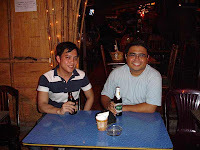 I tagged along my SSEAYP batchmate Noby who is celebrating his birthday today. As expected, the food was fantastic, the best of LJC!!! There was just so much food from the menu of his different restaurants, I wasn't able to taste every dish served on the buffet table. Nurture Spa is also opening a branch in Abe's Farm and there was a special rate for everyone today, P500 for all treatments, one day only! That included massages, foot spa and facials. Sorry guys but they'll be regular price beginning tomorrow. I finally got my hilot spa treatment. 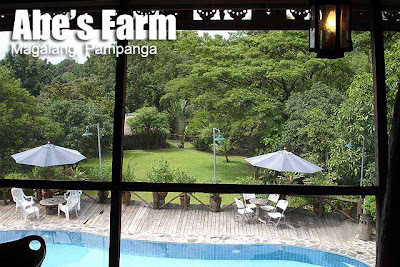 This spa features massages such as "Seseng-Ima," a Kapampangan-inspired massage, "Aruga," "Payapa," and the "Hilot Kagalingan" which was done as I described in an earlier post, with coconut oil and warm banana leaves. 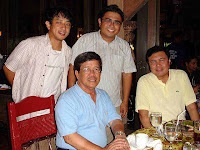 Of course, we met some VIPs and I told Noby he was lucky to meet Senate President Manny Villar (right) among many others. We were back in Manila after three hours in traffic. Will someone please tell the NLEX to speed up their repair works in Balintawak. It's stressful and draining to drive in that area! Anyway, more photos of this fantastic place in Multiply. During my second day in Vietnam, I decided to go on a Mekong River tour. The thing I like about mainland Southeast Asian destinations is that it’s so easy to book tours even if you’re just alone. I spent US$7 for a whole day tour which included lunch. I was picked up at my hotel at 8 a.m. and we were off to My Tho City, one and a half hours away. We took a small roofed pump boat a few minutes from the city center. The river was very wide and we got to see many fishing boats, ferries and floating houses. 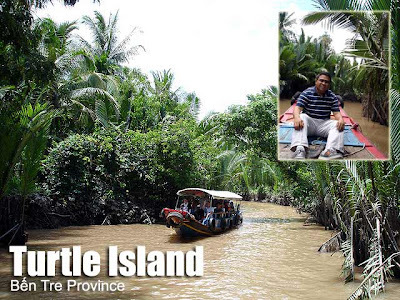 Most of the tour was going to be in Ben Tre province across the river. Our first stop was a small coconut candy factory in Turtle Island where we got to see how they made the local delicacies. From there, we went back to the boat and stopped over a fruit orchard where to my surprise, we were given bicycles for a ride around the area. Nothing fancy actually, it was the typical rural life in Vietnam which one can see here in the Philippines. But I’m sure the other foreigners in my group were excited with the new experience. We have better rural scenes in the Philippines. But there was no grassroots tourism program like this where the locals benefit directly. Our DOT is focusing too much on big resorts and golf courses, local residents don’t get to benefit too much from the tourism boom. After the bike ride, we were served lunch in the fruit orchard. It was a small serving of spring rolls, pork, soup and rice. You could order more but it was a bit pricey. 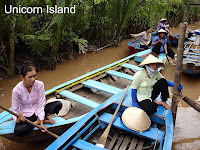 From there, we boarded our boat again and rode to Unicorn Island where first visited a bee-keeping farm to taste the honey, honey tea and honey wine. 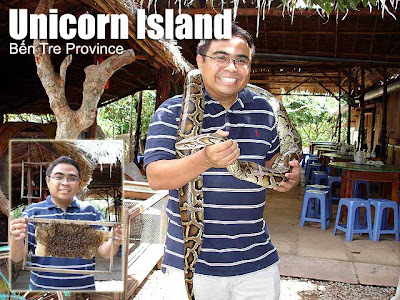 But we got more than that since we got to play with their pet python too. But the highlight of this part was that each of us was given a serving of snake wine! We walked down the path to another area of the island where we enjoyed the local tropical fruits while being serenaded with Vietnamese traditional folk-song music performed by the locals. On the way back to the boat, we had to ride small paddle boats from the restaurant which took us through narrow river creeks shaded by nipa plants. We boarded our boat and headed back to the port. From the port, we boarded our van and made a brief stopover at the bonsai garden in My Tho. Didn’t see much but I got some jackfruit snacks to munch on. 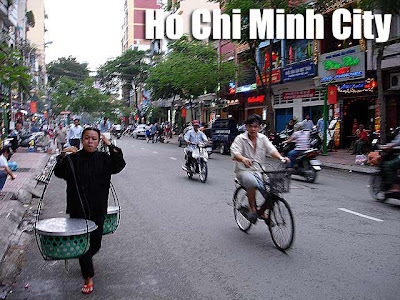 We were back in Ho Chi Minh at 5:30 p.m. More photos in Multiply. The following day, I decided to take it slow. I wanted to get away from the pulsating beat of orderly disorder that characterized Saigon. 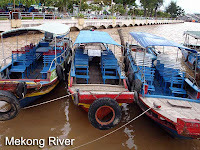 So I booked myself on a trip to the Mekong River that would take me one and a half-hours outside Saigon to the city of My Tho and Ben Tre Province. The van passed by for me at my hotel at 8:00 a.m. and we were back in Saigon’s urban chaos exactly at 5:30 p.m. I'll discuss that in a later entry. 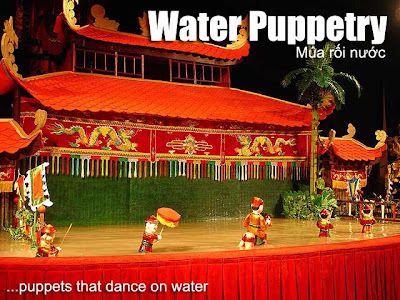 Back in Hồ Chí Minh City, as soon as I stepped down the van, I rushed back to my hotel to change and drop off my stuff since I wanted to catch the 6:30 p.m. water puppet performance. I took a cab from my hotel to the Golden Dragon Water Puppet Theatre to catch one of Vietnam's cultural symbols. It was a brief 50-minute show which is a must visit for culture vultures like myself. I realized I had been so stingy like always that I had a lot of funds left. So I decided to check out the Vietnamese restaurant my hotel recommended called Hoang Yen Restaurant. I had minced meat soup, spring rolls and chicken wings. It wasn’t as cheap as what you’d get from hawkers or hole-in-the-wall establishments. In fact, it wasn't even close! But it’s worth a try if you have some extra money to spend. From the restaurant, I walked to the Ho Chi Minh City Hall to check out this wonderful work of art well lit at night. The intricate detail of this charming French colonial government building never fails to enchant me, even more when it is lit up in the evening. I didn't stay too long since I had wanted to sleep early. But a college friend, who I met in the plane on the way to HCMC, sent me a message that we meet up. So it was another night at Allez Boo (this time I downed a bottle of Saigon beer and a pizza). But we decided to go around and we moved to Gossip to check out the clubbing scene. It seemed the young, rich and trendiest of HCMC were all there on a Wednesday night. It was one big parteee! The next day, I woke up early for some last minute shots around HCMC before my flight back to Manila. I got myself a xe om (motorbike for hire) for an hour to take me around District 1. 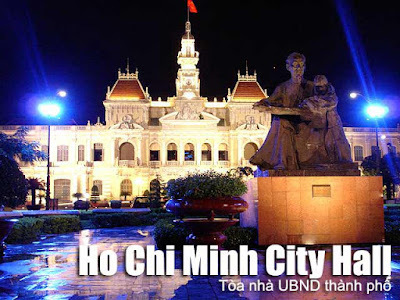 Of course, I dropped by the Ho Chi Minh City Hall again and the nearby Saigon Opera House. I watched as the city woke up with joggers and old folks doing their morning rituals; and motorbikes started to increase in number. But I didn’t have that much time since I had to be at the airport by 8 a.m. I wish I had more time to explore. But at least I got back to Manila in one piece since I felt that I was in the middle of a giant traffic accident waiting to happen. If there’s a next time, I definitely will rent my own motorbike and join the fun! Showtimes: 6:30 p.m. & 8 p.m.